Winter music can be cold and imposing, or warm and inviting; it can feel like a harsh breeze or a comforting blanket. Our Winter Music feature highlights sounds that are inspired by winter and reflect the elements of the season. Many of the selections below were also recorded during the winter; snow and ice are frequent friends. The music is presented in listening order. This feature continues to offer an alternative to holiday music, which has a much shorter shelf life and tends to be overdone. Not even active Christians want to hear Christmas music in January. These sounds have been chosen to last until the spring thaw. Regular readers may note that most of these selections are new to this site; some were too short to review, some were released out of season, and some just arrived. But now they’ve all found a home. We hope you enjoy our selection of The Year’s Best Winter Music! Released in the heart of winter, Before We Lost Ourselves is a series of “infinite loops” that soothes the mind and allows one’s thoughts to tumble to past, present and future as if they were all happening at once ~ as well they may be. With a cassette player set to repeat, one might play these half-hour tracks forever. Strings swell, static pops, drone clouds dissipate and surge. To listen is to surrender to vast fields of white, a seemingly unchanging landscape that below the surface remains very much in flux. Our original review can be found here. Last Christmas Eve, Dino Spiluttini was depressed, but after a long winter nap he decided to put his emotions to good use. For many people, the most wonderful time of the year is also the loneliest. The sounds of Spiluttini’s self-released 2015 cassette, along with 2016’s single-track follow-up, reflect the mournful, lethargic feelings associated with seasonal affective disorder. Listening provides empathy and solace. In his isolation, the artist imagines the changing textures of the drifting, billowing snow, and translates them into slow and graceful tones. Unlike other Christmas music, these tapes won’t wear out their welcome. If this is what it sounds like to be lost, may we be lost together. Graced by lovely symbolic art from Cecilia Afonso Esteves and subtly subdued music from Federico Durand, Jardín de invierno is the most complete package of the winter season. Recorded in a “cold old house”, the album makes use of toy instruments and pinging tones, reminiscent of Lullatone, but with a slower pace and scuffier patina. These miniatures sound like frost on the windows, falling snow, the twinkle of sun on icy branches. The entire album is remarkably consistent, a series of tiny treasures that come across as gifts. Through it all, a static breeze blows against the windows, begging listeners to get up and look, and eventually to go out and play. Of all the winter music released in 2016, this album is the finest; for the complete experience, we recommend the physical edition. The Glacial Movements name is synonymous with winter music, as every release contains a cold-inspired theme. Song from the end of the world is the label’s darkest release of the year, imagining a future in which global warming unlocks viruses from the ice. This may be science fiction, but it’s based on fact, a chilling truth reflected in the music. Looped melodies are joined by shortwave radio transmissions, decayed voices and a sense of impending doom. “A Listening Ice” and “An Answer in Ice” are especially powerful, hovering like unseen, unstoppable threats. Click on the link below for more 2016 winter music from Glacial Movements, including albums by Chihei Hatakeyama & Dirk Serries, Philippe Petit, Aria Rostami & Daniel Blomquist and Council State Electronics. The second part of Bondarev’s Siberian Trilogy doesn’t sound like winter at first ~ the guitar is warm, and the birds are active, as if enjoying a beautiful spring. But give it time. As the tape progresses, the field recordings begin to paint a sparser picture. The barren strings of the second side are like frozen trees shivering beneath the ice. Even the birds seem a bit lonely, as if tweeting, “Where have all our friends flown? Why is it so cold outside? Do you know where we can find some berries?” As all outdoor life falls silent, Bondarev’s piano comes alive, offering a eulogy for the warmth. One of the most recent recordings on our list, Gareth Broke’s December is the second installment of a seasonal series that began with the September EP and will continue to expand in the new year. 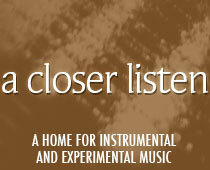 Like its predecessor, the new EP is piano-based, and conjures images of safe white fields. But the addition of field recordings, most apparent on “We walk”, and orchestral elements, evident throughout the “The empty church”, make this a much fuller recording. The sounds of footsteps and passing traffic allow the listener to make a visceral connection to the subject matter: the approach of the coldest season. By implying an outer cold and an inner warmth, Broke wraps the season in a tidy bow. Winter is coming, yet we need not be afraid. Extra points to Anna Salzmann for the lovely watercolor art. In terms of winter music, the go-to track is the tender “Winter Morning I”, a worthy successor to Nils Frahm’s Wintermusik, #3 of our 25 Best Winter Albums of All Time. This nine-minute piano piece is matched by a harmonium-enhanced “Winter Morning II,” including narration by Robert DeNiro; the full project is the score to a bittersweet documentary about Ellis Island. We can hear the performer’s intakes of breath, the light sledge of the keys, the tightness of the floorboards; by extension, we can imagine the shivering refugees, pulling their scant clothes near, hoping and praying for a better life ~ and in the end, simply for life. An air of melancholy enfolds the ivories, as well as the project as a whole. But as the strings enter in the closing minutes, a bit of hope enters as well. Peter Honselak went all-out with this release, recorded over the course of several cold winters and focusing solely on snow. The painted special edition is covered with white paste that imitates hard-packed ground. A sense of isolation descends in the center tracks, reflected in the cover image of a lone figure at the end of a long path. But when the piano and viola are joined by guitar, bass and drums, the timbre changes from modern composition to post-rock and the mood from lost to noble. The album reflects struggles inner and outer: a man against the elements, walking toward a final confrontation. The finale implies resolution: through turmoil, a certain peace has been achieved. Cowbells, yodeling and Richard Strauss? Oh my! The Orb’s Alpine Trilogy began with an appearance on last year’s Pop Ambient collection, and this 12″ appeared just as the snows were melting in the final days of March. Together, these three tracks highlight the fun that can be had in winter, evoking chill-out culture in a literal sense. Marked by crisp stereo effects, this triptych is likely to find new life in clubs as the colder weather descends. The nula filecasts are among the most mysterious online. Uncredited field recordings appear on a regular basis, evocative of time and place. This one comes from Armenia’s Sanahin monastery, where “the late winter snows are wet and heavy, dripping profusely in the afternoon sun.” The recording is a reminder that the change of seasons may also reflect a spiritual shift, with heavy burdens shed, hearts melting, eyes turning again to the sun. Also of interest: nula’s subsequent broadcast, cold fire.